http://www.xtarlight.com/05-chanpin/p-001-1.asp?styleid=354 : Product Page . Seriously , for starters - That's a cool name ! 2nd , the micro USB port is not one I have seen before . I have a cable for digital cameras , but this one is slightly larger so dont lose the factory supplied USB cable . Xtar has certainly pulled this off well . I can see the RC1 being charged from any USB port , be it a USB to cigarette lighter adapter for charging in the car , or a USB wall adapter , your computer or one of your Xtar chargers with a USB charging connection . Oh heck even a solar panel that does 5v charging . This makes the RC1 seriously versatile as far as recharging goes . The build quality is excellent , it is a really well built light . So far I have nothing to complain about , it really is a quality product and one I hope stands the test of time . Lets move onto the forward clicky as it looks like some thought may have gone into making it a little extra trick ! When you press the clicky , there is a little bit of movement and then the light turns on ( sorry it is a forward clicky ) and you press further in before meeting any resistance . What we have , or I have , is a two stage clicky switch , much like the old two stage military triggers from 50 - 100 years ago . So the first stage is for your momentary on ( very little resistance ) , the second stage is for clicking on the light . I really hope this is not just a quirk with mine because it really is trick . The emitter is really well centered in the orange peel reflector , and the light does look to throw well . Not nearly as flood'y as a XML , it is a little more reminiscent of a XR-E with not quite as tight a beam , but for those that dont like flood , you will probably love this beam profile . I can really see this light working for say a security guard that drives around all night shining his torch into dark places , with USB charging I dont see why the light would not be ready for use 24/7 . The machining of the threads , and the fit of the parts is excellent . O rings where they need to be and the threads are factory lubed for really slick operation . The anodizing is just excellent , and shaking the light really hard - there is not slapping around of the battery . Now lets talk about the USB charging , I got the light with the battery @ 3.75v . To charge the battery , turn on the light and plug in the USB plug - it will automatically turn the light off and start charging . It took one hour to get to 3.89v , another hour to get to 4.10v and an hour latter it was done ( well I checked after another hour ) @ 4.16v measured on completion . There is a little red light that comes on to let you know that the battery is being charged and when the charging is complete it turns green . Also if you plug in the USB and the light is green , then the battery is not being charged . Pull the plug out , turn on the light and plug in the USB and it should start charging . To get to the USB port , just unscrew the collar counter clock wise to open and clock wise to close it again . Dont worry , there are two O-rings to keep moisture away from the USB port , one above and another bellow the USB port . The battery is fully charged so I will get back with some figures for output and current draw .. The RC1 is slightly longer than my two go to lights , considering the RC1 also charges the battery I think this is a very small price to pay for such convenience . I simply can't think of a single negative thing to say . Im sure people will prefer this or that , or have an opinion , but to find fault ? I'm sorry , I cant think of anything to fault . Some one at XTAR set a design goal , a function goal , and the RC1 does what it was designed to do exceedingly well . I am impressed by the XTAR RC1. In the past I had no experience with a USB charged light , nor did I see the need in one . But after having experienced the RC1 I can see a multitude of situations where the RC1 would make perfect sense . The convenience of being able to charge your flashlight almost anywhere from a multitude of sources is simply brilliant . Two stage tail clicky ( by design or happy accident ? ) I love it either way ! High and low modes - I can live with it , 1.4A on high and 0.190A on low - I can live with it . USB charging - It works , and its not painfully slow . Wow , this is a very nice flashlight and even if you were to hate charging VIA the USB port , this is such a nice flashlight and you could just pull out the battery and pop in a fresh one if the USB offends you . I am really looking forward to reading other reviews on this light , to see what other people think of it . Bottom line is , would I recommend this light = YES .. If the sample I have is the standard of all lights leaving the factory , I think new owners are going to be very impressed . 10 out of 10 Xtar - The RC1 is excellent ! nice pictures! 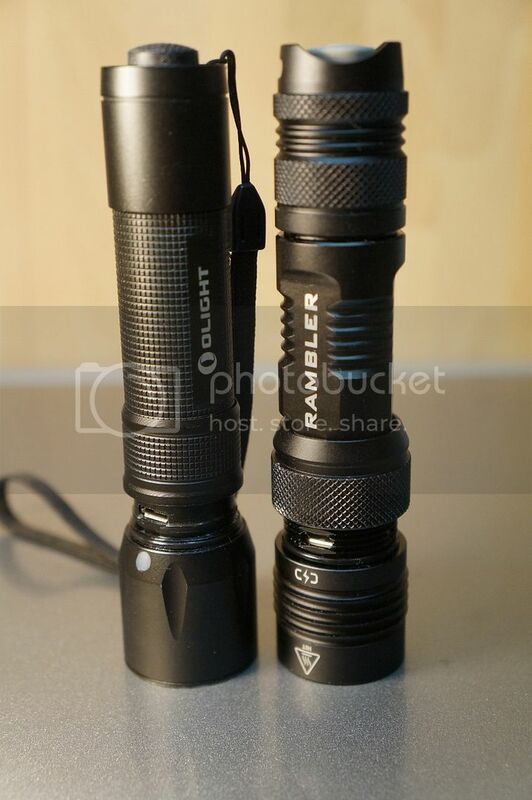 this light would be nice to be compared to the Olight R20 and the Manker Rambler... pretty the same concept !http://i1148.photobucket.com/albums/o562/Martin_Rathmanner/Manker%20Ramb...! which i like btw! There does seem to be a few about .. I still really like the design of the Solarforce L2 in the middle of one of the photos. One of my favorite designs. Thanks for the review old4570 . 2nd , the micro USB port is not one I have seen before . I have a cable for digital cameras , but this one is slightly larger so dont lose the factory supplied USB cable . Hi mate, your great review and 10/10 score has made me add this to my future-buy list. That future is always fast approaching when it comes to new lights! One thing that worries me though is your assessment of the USB port being non-standard. Are you definitely certain of this? XTAR's announcement blurb states "Micro USB charging port – Compatible with all USB wall adaptors or any USB power sources". I would find it very puzzling why they would use some proprietary USB-like shape when standard micro-USB is so well established and would bring the manufacturing price down. XTAR aren't Apple after all !! Many thanks again for the effort, it's much appreciated. So its a Micro USB , again not familiar to me , as this is the first device to use one ... Of this particular shape .. Guess there is a first time for everything ..